Welcome to the Feruary 18, 2008 Carnival of Divided Government Vîcênsimus - Special California Primary Post-Mortem Presidents Day Edition. This is our second divided government carnival of 2008, and is more than two weeks behind schedule. I can give a lot of excuses why this carnival is so delayed, but I have decided that you can handle the truth. You see, I have been sulking. The reason for my dark tea-time of the soul after the introduction. As explained in earlier editions, we have adopted Latin ordinal numeration in order to impart a patina of gravitas reflecting the historical importance of the series. In this, the Vîcênsimus edition, as in all of the CODGOV series, we select volunteers and draftees from the blogosphere and main stream media on the singular topic of government divided between the major parties (leaving it to the reader to sort out volunteers from draftees). Consistent with this topic, the primary criteria for acceptance in the carnival is to explicitly use the words and/or concept of "divided government" in submitted posts. A criteria that, to our endless befuddlement, is ignored by many of the bloggers submitting posts, which sadly results in DWSUWF reluctantly ignoring their fine submissions. For this carnival, we received many submissions and not one of them was on-topic. None. Nada. Zip. Zero. 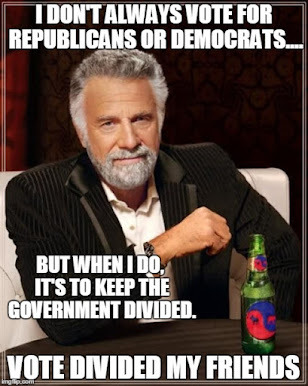 C'mon people, how hard is it to put the words "divided government" or "gridlock" in your post? I did select one submission to include as a proxy for all of the off-topic posts, and for the rest we present our first 100% draftee Carnival. Perhaps it is appropriate to publish this non-carnival carnival on a Presidents Day holiday scheduled for a day on which no US President has ever been born. The US Mint announced the release of four more coins in the $1 Gold presidents series - covering presidents five through eight - Monroe, Adams, Jackson and Van Buren. Last year, the 2007 Presidents Day Carnival revealed a sneak peak of what the George W Bush and Bill Clinton coins would look like. This year we preview the potential 44th Presidential coin. And so, without further ado, some new divided Government posts and articles. Since we are not concerned about actual submissions, we'll start with some main stream media selections as a lesson to the entire blogospere. "Why do voters ticket-split, choosing a President from one party and a Representative or Senator from another? Perhaps it's a clever way to preserve the creative tension of divided government, check the excesses of any one party and send a veiled warning to everyone in Washington that it's time for a little bipartisanship." "In the end, though, if I were a titan of industry, I'd root for both parties: I'd be a fan of divided government, because government tends to be most efficient when the White House and Congress are keeping a wary eye on each other. Moreover, when something is truly in the nation's best economic interest -- take the 1986 tax reforms or passage of NAFTA in 1993 -- it takes Republicans and Democrats working together to get things done.So, my fellow capitalists, vote for different parties to rule on either end of Pennsylvania Avenue." "Add to that obstructionist minority a divided government (the White House controlled by one party, Congress by another), the tensions of an ongoing war and a lame-duck president with no chosen successor and thus little concern for his plummeting popularity, and you have a moment that laughs at legislative progress. That's why the presidential campaign has become so focused on "getting things done." Ezra is railing against the disingenuous invocation of Unity by presidential candidates, saying that the executive can do little to overcome obstruction by the minority, until and unless we change the framework of the Senate and the Constitution to permit the majority to run roughshod over the minority. This tends to be a popular view by both the left and right when they are in a a majority and tends to be unpopular when they are in a minority. In both cases all are ignoring the fact that our government is working exactly the way it was designed by the founders, specifically to prevent a tyranny of the majority. Legislative obstruction, is an indicator of the good health of a properly functioning government. "The package could be passed by Congress in as little as a week or two. Divided government means that both parties could get blamed for a severe recession, and neither wants that with an election looming. One should never underestimate the capacity of individual senators to delay even the most popular bills, but the mood in Washington is for action, bold and speedy. Whether the stimulus package will prevent a recession is anyone's guess." I guess that there is two ways to look at this. One - This is proof that if it is important and needed bill, a Divided Government state in Washington will prove to be no obstruction to a quick passage. - OR - This is the exception that proved the rule and Divided Government failed to even place a speedbump in the way of a truly wasteful and pointless bill. That would be my guess. "在這裡我首先想聲明，主辦單位將主題定為「馬、謝當選總統後的十大要務」是不太好的。在我認為，主辦單位的意思是，如果馬英九當選了，將呈現一個 unified government 的局面；而若是謝長廷當選了，就成為 divided government 的局面。故重點應該是在聯合政府與分裂政府下，總統應該做的重點分別是哪些？"
The point is intuitively obvious and I am sure you feel as strongly as I do about this article, so no further comment is needed. "The armed power of the people, organized outside of the state, or at least under a sufficiently independent branch of it, was also at one time an effective check on state power in the Anglo-American world, although it is clear that it does not function this way in modern America. It is, however, precisely this power to which the other branches of a divided government must have recourse when one branch comes to exclusive control of the state-organized military force and/or comes to abuse its power. Even the persuasive threat of this outside check will be enough to stop a great deal of evil." "Finally, even aside from McCain's strengths and weaknesses as an individual, there are great benefits to divided government. As I argue here and here, it's one of the best ways of limiting the growth of government power. Since the Democrats are almost certain to retain control of both houses of Congress... John McCain may be the only hope for maintaining divided government in 2008... The key comparison is not between divided government and some ideal state, but between divided government with McCain and united government with the Democrats controlling the presidency and both houses of Congress. Given the Democrats' likely agenda, the latter scenario could well lead to a major expansion of government that will be difficult to undo even if the Republicans return to power in 2012 or 2016." I will not be happy voting for McCain because of his stance on the Iraq war, but the Divided Government benefits may still outweigh the risks of a unifed single party Democratic Government, particularly with the likely significant expansion of the Democratic majorities in Congress. 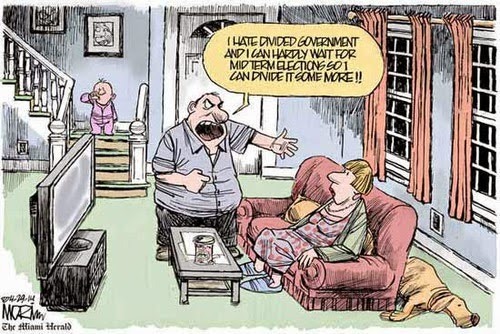 "Divided government. The presidency is a lost cause at this point, but its possible to regain the House and the Senate to act as a brake on the more egregiously fascistic notions of a Democrat president or Hillary Clinton. Get good, solid conservative men and women to run for for Congress, give them cash, volunteer and evangelize. Winning back the Senate should be priority one. I'm not the only one who has thought of this--its effectively a no-brainer." "Here is your problem. The Democrats will not lose the House or Senate in 2008. There are 33 Senate seats contested in 2008. Of these, 21 are held by Republicans and 12 by Democrats. Simple numbers lead to a simple conclusion - the Republicans have more at risk, and the Democrats have many more opportunities to take seats than Republicans. This is a crushing structural advantage for Democrats. Add to the sturctural problem Republican retirements (Warner, Hagel) putting safe seats in play and the Craig mess in Idaho. The Senate is out of reach, but what about the House? The House of Representatives has never changed majorities in the 100 years since we have been directly electing Senators, unless the Senate also changed majorities. Never. Not even once. The conclusion is clear. In 2009 we'll again have a Democratic House and Senate. The benefits of divided government can only be maintained by electing a Republican or independent 3rd party President in 2008. Absent that, we are on a hell-bound train for Democratic President, expanded Democratic majorities in both houses and even a potential filibuster-proof 60 vote Dem plurality in the Senate." "What people often don't realize is that this is how the Founding Fathers established our government so that there would be checks and balances among all the branches of government in order that, as Madison wrote in Federalist 51, "ambition must be made to counteract ambition." Fearing that the new sort of government being founded in 1787 would allow the sort of tyranny that we'd just fought a war to rebel against, the Founders deliberately created a system where the passions of humans would be controlled by the structure of the new government." I may have to pick up a few rolls of James Madison dollars. He is my new favorite president. Traditionally, we conclude this Carnival by including one "off-topic" submission, as a grudging acknowledgment and proxy for the many off-topic submissions received. Off-topic in this context meaning - no mentions of "divided government" or gridlock. For this edition, the selection was a bit overwhelming since ALL SUBMISSIONS WERE OFF TOPIC. I considered just picking one randomly, but settled instead on Doug Ragans thoroughly rational advice on how to manage a non-existent recession. Advoce that will, of course, be ignored. Doug Ragan presents A Simple Fix For The US Economy posted at I'm A Pundit Too, saying, "We have had too many short term fixes from our government. It is time to look long term in respect to interest rates and taxes." And with that we conclude this edition.Thanks for stopping by, and thanks for all of the submissions (on-topic or not). The next edition will be the Carnival of Divided Government Unus et Vîcênsimus - Special Ides of March Edition, which we have elected to post on or about Saturday, March 15. Submit your blog article at carnival of divided government using our carnival submission form. Past posts can be found on our blog carnival index page. The Maiden's monthly compilation "February: This is not my country" at Hell's Handmaiden. Mark Raynar presents "The Carnival of Satire #93" hosted at The Skwib. The New Pundit presents "The Carnival of Political Punditry Feb 17", posted at The New Pundit. Shaheen Lockhan presents "Brain Blogging 27th Edition" posted at Brain Blogger. Jill presents the "Carnival of Ohio Politics #104" posted at Ohio Politics. Admin launches the brand new "Mondays Blog Carnivals" at DotNLP. Lost presents "Carnival for Short Stories Edition IX" at Musings of a Med Student.